In celebration of my birthday today, I thought I'd share a little tute with you!! I made this one for my dear friend Rebecca for a swap we did. I had some requests for a pattern so I thought I'd share a tute with you so you can make one based on the frame you have. There are lots of different shapes and sizes of purse frames. Both the pouches pictured use a medium sized frame - 5" wide at the bottom x 1 1/2" tall. The great news is that you can use any size frame based on this tutorial. ~1 metal purse frame - I like the sew in type. 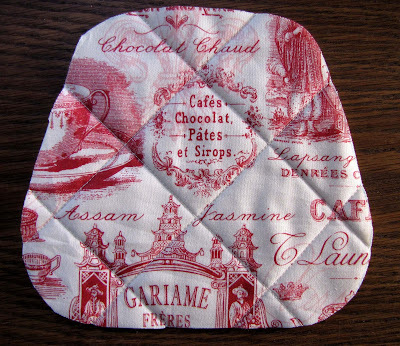 The one used in this tutorial is 4" wide at the top x 5" wide at the bottom x 1½" high. A similar one can be found HERE. 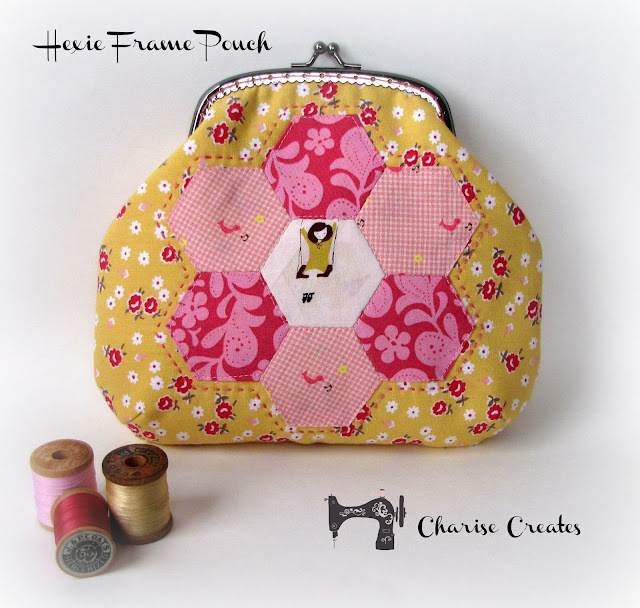 This is a great project to add hexies or use an orphaned paper pieced block or quilt block. ~ Mark a vertical line toward the left edge of your paper. This is the center or fold line of the pouch. ~ Place the center of the frame on the center line on your paper. ~ Trace the top of the frame to the curve. 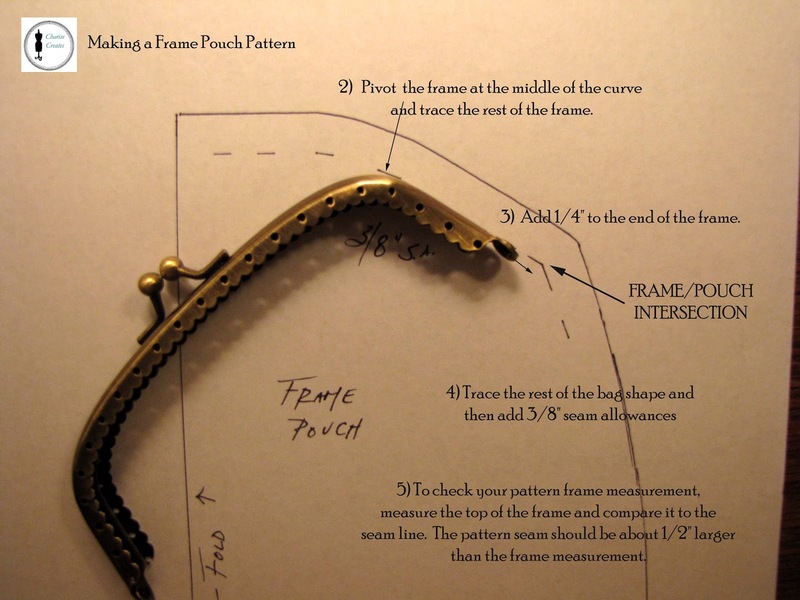 ~ Pivot the frame at the middle of the curve and trace the rest of the frame. The more of an angle and width you add, the wider and "poofier" the pouch will be. ~ Add 1/4" to the end of the frame. 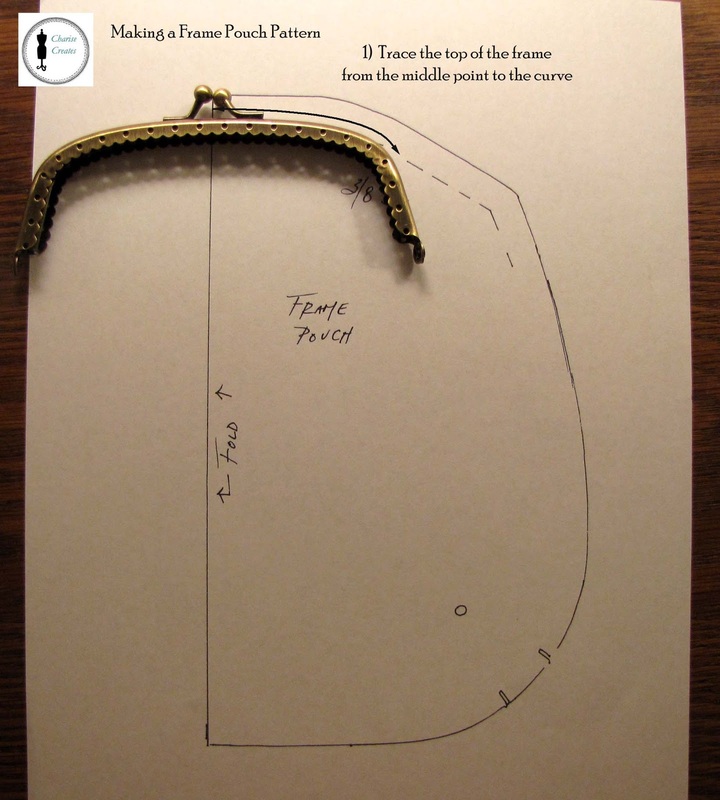 ~ Draw in the rest of the bag shape and then add 3/8" seam allowance all around. 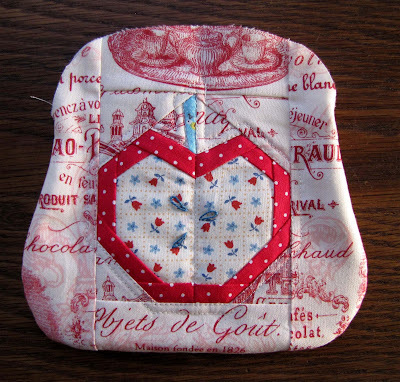 This pouch measures 7 1/2" High x 8 3/4" wide at the widest point. I added darts to this pouch to give it a bit more shape. The darts are 3/4" wide x 1 1/4" tall. 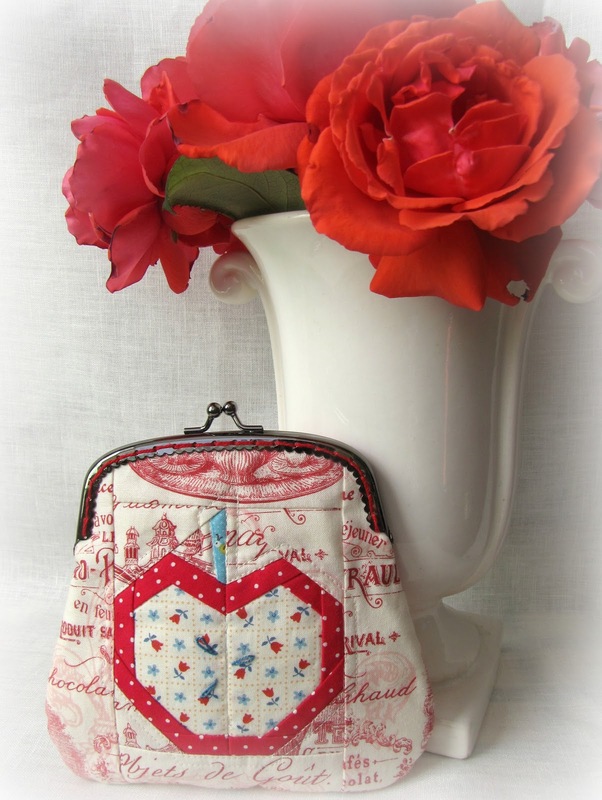 The instructions use photos of the pouch pictured above but will work for any pouch pattern. Prepare the outside panels of your pouch. 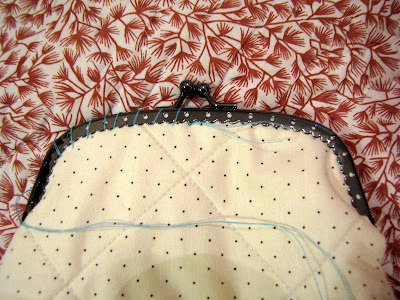 1) Sew the outside panels of your pouch if doing a paper piecing block, quilt block, or hexie design. Make sure your block is bigger than the pattern, approx. 10" x 10". 2) Apply the fusible fleece to both wrong sides of your outside pouch panels. 3) Place your pattern on the quilted panels. Trace around the edge and cut out. If your pattern has darts, stitch them now. 1) Place your outside pouch panels right sides together. 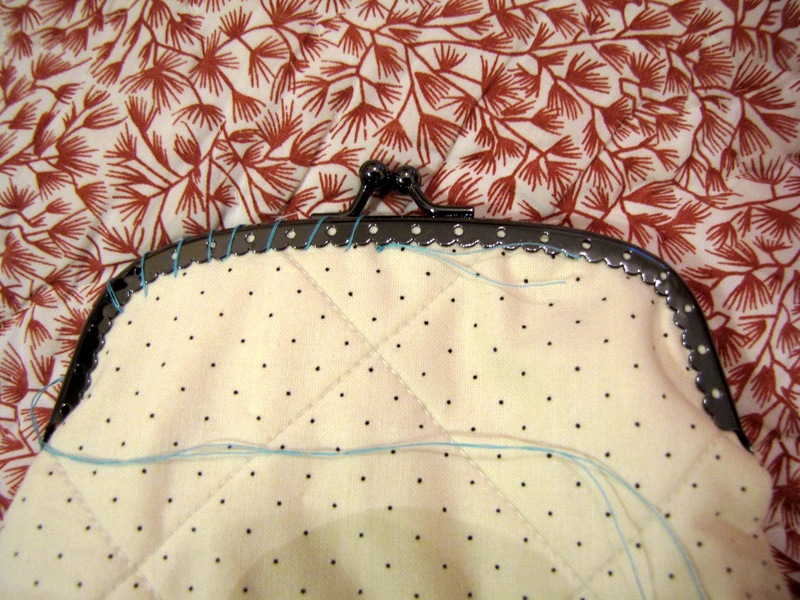 2) Start at the frame/pouch intersection stitch around the bottom to the other side. 3) Turn right side out. 1) Cut your lining pieces. Stitch the darts if they are part of the pattern. 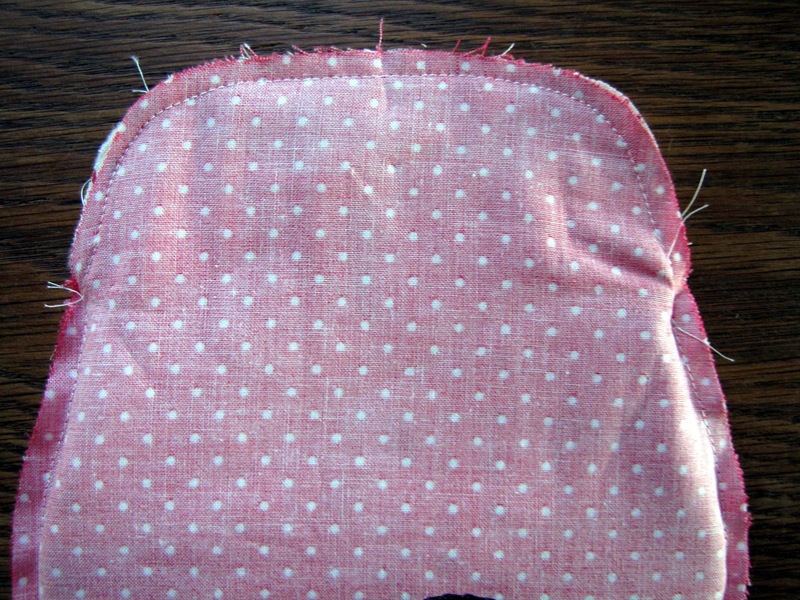 2) Place your lining pieces right sides together. 3) Start at the frame/pouch intersection stitch around the bottom to the other side leaving a 3" opening at the bottom for turning. 1) Place the outside pouch inside the lining, right sides together. 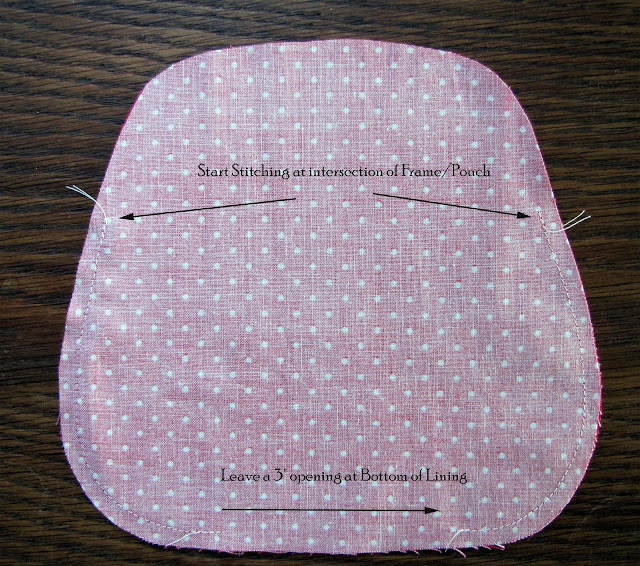 2) On one side, Stitch the outside pouch to the lining starting at frame/pouch intersection stitch around the top to the other side. 4) Stitch the lining opening closed with an edge stitch or a hand slip stitch. 2) Starting at the center, baste the frame to the pouch on either side. 3) Stitch the Frame to the pouch with Perle cotton embroidery thread. I'd love to see your version of the frame pouch. Please include your projects in my Flickr group here. Have a great day! My 28th ; ) birthday will be filled with an Art Docent Lesson on Van Gogh to 27 Kindergarteners, hopefully a trip to Anthropologie just for fun, and an evening viewing of "Anna Karenina" with my hubs! Happy Birthday!! Your pouch is gorgeous! Thanks for sharing your detailed method! I really want to try one of these! Fabulous pouch and thanks for the tutorial! Happy Birthday! That's a beautiful pouch! Happy Birthday Cherise! Big birthdays are good ones ~ life just keeps getting better! Love the pouch ~ it's so sweet. Oh, and by the way. I noticed your last name on your etsy shop ~ my maiden name is Randel. We could be related some way or other! Happy birthday! I love that little purse. I have not tried using a metal clasp yet. Maybe with your tutorial I'll try it. Thanks. HAPPY BIRTHDAY! What a treat to get the great tutorial too! I've wanted to try one of these kinds of purses and with your great instructions now I will! Thank you and enjoy YOUR special day! Today is your Birthday and you gave us this gorgeous gift?!!! Thank you sooooo much and Happy Birthday to you!!! Thanks for the wonderful tutorial....can't wait to make it! Happy, B-day, Charise! This is such a cute bag... thanks for the tuto! Happy Birthday Cherise!!! Love the tutorial and thanks a lot for it. Now I just need to go and get the frame from somewhere here in the U.K.
Do you have a suggestion for gluing if the frame is not the sew-on kind? I have several frames without the sewing holes & they're the devil to try to glue! I would also "bing" or "google" frame pouch and I'm sure there are many more tutorials on the web. First: only glue one side of the frame at a time. Don't get hasty and try to do both sides simultaneously. You want to use a glue for fabric and metal AND also add a bit of tight string/cording to ram/wedge (small flat-bladed screwdriver) the string and fabric into the frame. The string helps wedge and keep the fabric inside the frame part. Take pliers that are masking-taped (so the plier 'teeth' won't mar the shiny frame) and squeeze shut the frame. It doesn't have to be totally squeezed shut - just enough to hold fabric inside. I usually just squeeze at the hinge area. Thanks Charise -- your pattern instructions were very clear. Thank you for your expertise Kathy! Hello, I´m from Spain and I´m starting on these things. I love all of them and thank you for your tutorial. THANK YOU VERY MUCH FOR THE DETAILED MASTER CLASS, HE HELPED ME TO CORRECT MY MISTAKES!